04/04/2019: Regularly visited when we lived this side of town but having moved we hadn't eaten from here in years. Got a set meal for two for £20 which fed 3 of us with lots of left overs. Lovely delicious hot fresh food bursting with flavour. Glad we decided to revisit + we will most definitely be back. Best take away in town! 29/03/2019: Love the food from here, definitely one of my go to places for a tasty takeaway. The chicken pakora is possibly the best I have had and I have sampled a few over the years. Highly recommended. 18/01/2019: Absolutely disgusting little restaurant. Decor really poor with electrical wires hanging and lights hanging off ceiling. Carpets filthy. Been twice, second time to give the benefit of the doubt. But second time was worse. No customers, no atmosphere, no staff to care. 29/11/2018: Piping hot quick delivery ..great!! Discovered this way of getting a Chinese meal without leaving the house..this is extremely useful on a cold wintry night . 21/10/2017: We love this small local Resturant. 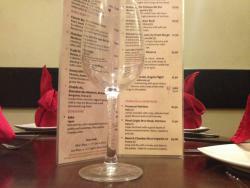 The food is fabulous and the owner Mr Khan is very eager to please. I once told him about a dish I’d had elsewhere that I really enjoyed and he had his chief make it especially for me. The surroundings are modest but the food surpasses expectation every time. 24/05/2016: Excellent waiter, very eager to please and a charming owner who also has a place in Kelso that we shall be trying later this week after such an enjoyable meal in Hawick.